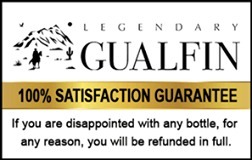 Tacana Malbec by Legendary Gualfin | Here’s the best deal in the world. Our vineyard can never be even close to profitable unless we can sell the wine directly to consumers. So, here’s what we’re going to do. We’re going to sell it the only way we know how: by subscription only. And we’re going to make you an offer that no one has ever made in the history of the wine business (as far as we know). Last year, was a good year. But our neighbor lost grapes to a flood. We promised him some of ours. This left us with only 5,800 available for the US. It won’t last long. Americans have discovered Argentine Malbec. And our dear readers have discovered Tacana. Last year, we began with even fewer bottles to sell – only 4,000. We sold out in 24 hours. And we offered a special guarantee: if you didn’t like it, we’d send your money back. As far as we know, no one in the wine business ever make such an offer. But we had confidence in Tacana. And we knew we had to prove ourselves. As it turned out, of all the 4,000 bottles sold…only 11 customers asked for a refund, which we gladly paid. Remember, it’s more intense than the wine you’re probably used to. Goes great with meat. The Argentines drink it with their big steaks, for example. We drink it with everything, everyday. Other wines now taste weak in comparison. Offer it to friends and neighbors. See what they say. And, if after you’ve gone through your supply, you think it did not live up to the promises and claims we’ve made for it, just say so. We’ll be happy to refund your money. Just as we did last year. No need to send anything back. We’ll take your word for it. So, the very worst that could happen is that you drink our wine at our expense! You can’t lose! You missed out last year. And this year the previous costumers had first dibs on the few bottles of RESERVA we had available. But we saved a few very special bottles – for you. Remember that our stock is very limited, so don’t delay. Previous customers… including those on the waiting list…. have already bought over 3000 bottles of this year’s wine that we had available. So, if you’d like to help us save the ranch, raise a glass and enjoy an exceptional Argentine Malbec, you can place your order below. Shipping wine is not as easy as shipping a book or a sweather – we have to protect it from damage, jostling, and extreme temperatures. Accordingly, we repack all our wine shipments in special wine shipping cases. Generally we ship UPS ground for all our shipments unless our customers specify otherwise. However, if you really need the wine sooner or you are concerned about temperature, please consider an expedited means of transportation. This site and the materials and products on this site are provided “as is” and without warranties of any kind, whether express or implied. To the fullest extent permissible pursuant to applicable law, WineVIP disclaims all warranties, express or implied, including, but not limited to, implied warranties of merchantability and fitness for a particular purpose and non-infringement. WineVIP does not represent or warrant that the functions contained in the site will be uninterrupted or error-free, that the defects will be corrected, or that this site or the server that makes the site available are free of viruses or other harmful components. WineVIP does not make any warrantees or representations regarding the use of the materials in this site in terms of their correctness, accuracy, adequacy, usefulness, timeliness, reliability or otherwise. Some states do not permit limitations or exclusions on warranties, so the above limitations may not apply to you. You agree to indemnify, defend, and hold harmless WineVIP, its officers, directors, employees, agents, licensors and suppliers (collectively the “Service Providers”) from and against all losses, expenses, damages and costs, including reasonable attorneys’ fees, resulting from any violation of these terms and conditions or any activity related to your account (including negligent or wrongful conduct) by you or any other person accessing the site using your Internet account. WineVIP has no control over gualfin.wine , it has a separate privacy and data collection practices, independent of WineVIP, therefore you access it at your own risk. 6 bottles of high-altitude Argentine Malbec. Tacana Malbec 2016: Straight from the Andes mountains in the north of Argentina, Tacana is unique, powerful and smooth wine. A dark purple-colored wine, Tacana contains aromas of dark fruits and opens up with the intensity and fleshy character typical of the Malbec varietal. Tacana Reserva 2015: This bold, New World wine benefits from Old World production techniques, including French oak barreling. Dark purple-colored, with more of a honey aroma, while keeping intact the characteristics of the Malbec varietal. Followed in the palate by a full-bodied wine with flavors of spice, black cherry and pepper. The finish is elegant and lengthy. Alcohol deliveries require an adult signature. No PO Box permitted. If you can send to an office or business address it may be easier than waiting at home. If you live in one of these states, you’ll need to select an alternative delivery destination.